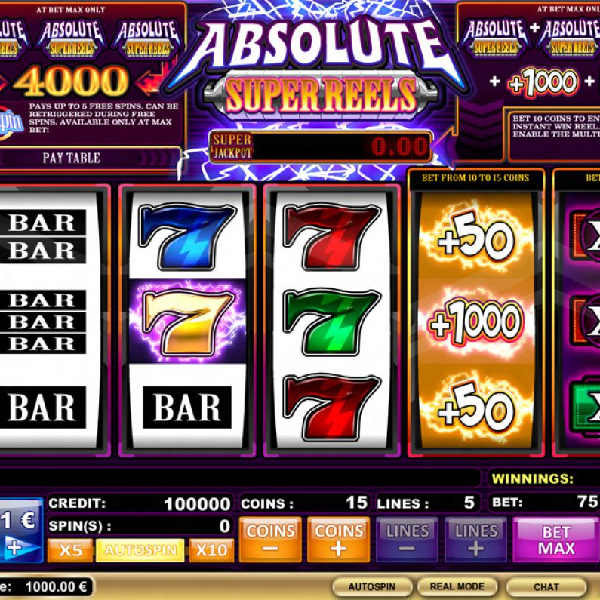 If you enjoy classic slot machines but also look for bonus features then iSoftBet’s new Absolute Super Reels slot may be the game for you. It is a 3 reel slot with 5 fixed paylines. The symbols are fairly traditional and include the game’s logo, different coloured sevens, and single, double and triple bars. There are no wild or special symbols but there are two extra reels to the right that have their own function. To activate the extra reels you need to bet a higher amount. Reel four adds an extra 50, 750 or 1,000 coins to a winning combination and reel five awards multipliers and free spins. The slot also offers a progressive jackpot and it is won if you land the game’s logo on reels one, two and three, a 1,000 coin win on the fourth reel and a 10x multiplier on the fifth reel.